The Digi Camo Cap is an aesthetic combination of a trendy, modern look and the classic style of the camouflage hunting hat. You just simply can’t go fishing or hunting without one of these bad boys. It is a true classic cap, equipped with such style and comfort you can’t find anywhere else. The manly Digi Camo Cap looks great on anyone, especially hunters, fishermen, and the burly men and women who like to enjoy the great outdoors. It provides the comfort of a regular truckers cap, and is distinctively characterized by its military texture and look. With a stylish digital camouflage finish, a regular nylon mesh, as well as comfortable cotton twill, the high-quality material really emphasizes the fashion of a classic camouflage look with a modern 21st century feel. The Ezycaps Digi Camo Cap offers nothing but sheer durability and flexibility, but most of all it can be embroidered or transfer-printed along with a logo of your choosing. Of course, when it comes to fashion, taste in clothes always varies from person to person. Some people like the minimalistic approach of plain and pastel colors, while others want to kick it up a notch with an aggressive style like the military camo texture. The Digi Camo Cap is, above all, a unique type of baseball cap. Then came the truckers and assimilated it that it’s now called a truckers cap, while at the same time popularizing the standard wear. The hard style attitude is what makes this product so great, as nobody can ignore the outstanding military camouflage texture. Manufactured with a cotton twill peak with front panels, and made with nylon mesh sides and back panels, the Digi Camo is loose enough not to cause sweating and gives breathing room for your head. With a perfectly structured design and cotton sweatband, the cap offers comfort and stability. Most importantly, the cap offers the option to print logos and various colored prints, so you can promote your company brand. All you need to do is just order and say what you would like to print on the cap, and we can customize the cap with your very own unique idea. We should mention that the Digi Camo doesn’t interfere with the heat transferred brand or logo and it will spread with no problems across the cap. It is simply perfect for grabbing anybody’s attention and stand out from the crowd. This stylish cap is fit for branding with embroidery, as well as many other transfer print ideas that will catch anyone’s eye. The Digi Camo custom branded caps is a great way to spread your brand and built custom loyalty. When it comes to choosing the perfect promotional products, both embroidered and printed, then the Digi Camo Cap is the way to go. The durability of the color withstands even the heaviest of washes, so it’s guaranteed that your printed logo will stay untouched as long as the cap itself. 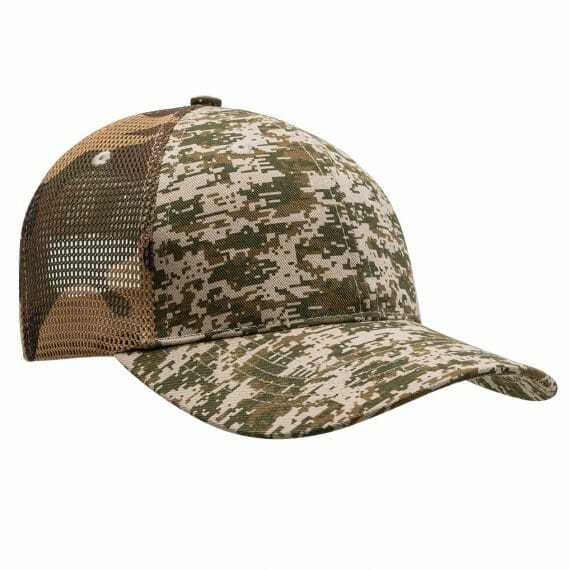 Don’t hesitate, the Digi Camo Cap is a great way to promote your idea or company logo. Whether you are getting in touch with nature in the great outdoors, or you are wandering the streets of the city, this cap is for you.